Right at the start, let's talk about the term 'hieroglyphics,' which is used so commonly to refer to the Mi'kmaw written symbology. The word is defined as 'figure of an object standing for a word, syllable or sound, as used in ancient Egyptian and other writing..." (Concise Oxford Dictionary, Seventh Edition.) The term hieroglyph is therefore inappropriate, since it refers to a one-to-one correlation between a glyph and a word, syllable or sound. More importantly, the word's association with Egyptian writing leads to a misinterpretation of what Mi'kmaw symbols represent. A more appropriate term is 'ideogram', defined as a "...character symbolizing idea of a thing without expressing the sequence of sounds in its name." With ideograms, each character represents a concept, which may be orally expressed with one or many words. So where did these ideograms come from? Some argue that European missionaries must have invented the system in its entirety, because pre-contact Aboriginal people are perceived as being illiterate. In most cases, though, the missionaries created a phonetic representation of an aboriginal language using the Roman characters they are familiar with, as did Silas Rand. Why, then, in cases where the people have a tradition of a written language, did the missionaries 'invent' a system of odd symbols that are not based on anything European? "Some of them wrote out their lessons in their own manner. They made use of a small piece of charcoal instead of a pen, and a piece of bark instead of paper. Their characters are novel, and so individual that one could not know or understand the writing of the other; that is to say, that they made use of certain marks according to their own ideas as of a local memory to preserve the points and the articles and the maxims which they had remembered. They carried away this paper with them to study in the repose of the night." "... our Lord inspired me with the idea of them the second year of my mission, when being much embarrassed as to the method by which I should teach the Indians to pray to God, I notice that some children were making marks with charcoal upon birch-bark, and were counting these with the finger very accurately at each word of prayers which they pronounced. This made me believe that by giving them some formulary, which would aid their memory by definite characters, I should advance much more quickly than by teaching them through the method of making them repeat a number of times that which I said to them. They preserve these instructive papers with so much care, and they have for them so particular an esteem, that they keep them very neatly in little cases of birch-bark bedecked with wampum, with beadwork, and with porcupine quills." 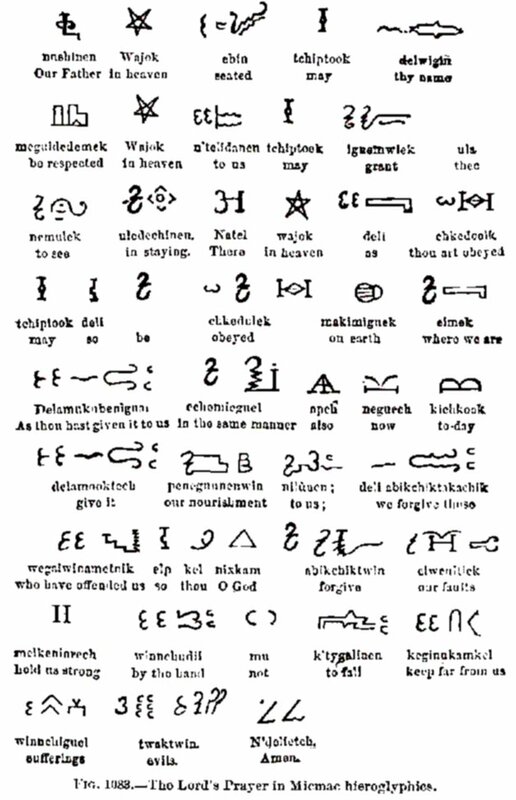 In 1738, l'Abbé Pierre-Antoine-Simon Maillard (French Seminary of Foreign Missions) also worked out the Mi'kmaw symbols, and published a grammar of the language. It appears that his work was independent of Le Clercq's, and Maillard devoted 8 years to the task. I beg leave herewith enclosed to send you the Lord's Prair & Creed, written by the Native Indians of Newfoundland, which they did it with a stick made in the shape of a pen. The Creed marked Number One, the Prair No. 2. I beg leave, Sir, to observe it the Roman Catholic Prair & Creed, as the Frenchmen have intermarried with those Indians. Source: British Library, Add. ms. 11038, fo. 13-16. "Several Indians possessed (in the time of the first French missions) in their wigwams, a kind of library, composed of stones and of pieces of bark, and the medicine men had large manuscripts of these peculiar characters, which they read over the sick persons... The Indians assert that by these signs they could express any idea with every modification, just as we do with our writings." Also in 1866, Father Vetromile persuades seminary friend and missionary neighbor Rev. Christian Kauder, a Redemptorist, to publish a collection of prayers, songs and catechisms in the Mi'kmaw ideograms, entitled "Buch das gute." (2) The publication of Rev. Kauder was in three parts: Catechism, 144 pages; religious reflections, 109 pages; and hymnal, 208 pages. On careful examination of the symbols, one can distinguish between some of the original Mi'kmaw symbols, each of which represented mnemonically a whole sentence or verse, and a large number of arbitrary designs that have been added to express ideas and words which were not Native American. For example, the symbol for Niskam (God) is a triangle, representing the holy trinity, and three other ideograms incorporating the triangle are used to represent the Father, Son and Holy Spirit. Many odd curlicues were incorporated with the symbols, intended to represent the peculiarities of the Mi'kmaw grammar as understood by Rev. Kauder. 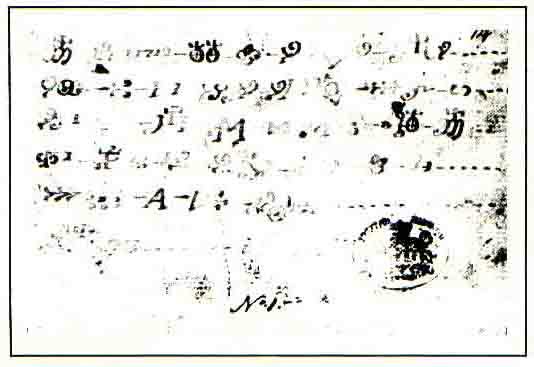 An example from this document is reproduced below. The book was re-released in 1921 by the Micmac Messenger organization. Finally, in 1921, Father Pacifique (Henri Buisson d’Valigny,) a Capuchin missionary who was extremely well-respected by the Mi'kmaq, publishes "Manual of Prayers, Introductions, Problems, and Hymns in Micmac Ideograms" in Restigouche, Quebec. While this document has earned Father Pacifique the reputation of having invented the writing system, it is in fact a re-issue of Kauder's book in French. Pacifique was apparently taught to read the symbols in 1900 by Peter Paul Denny Sr. at Chapel Island, NS. However, to his credit it should be noted that Father Pacifique did develop his own orthography, which is still in use in New Brunswick, and he also published many books for the Mi'kmaq, including an extensive grammar in 1939. So what happened to the ideograms? Apparently, a written language was not that useful to the Mi'kmaq, being a primarily oral culture. Various sources have said that the Mi'kmaq would occasionally leave notes in a marker beside a trail for followers, or record information for future reference. However, the ideograms were not a major part of their life, and consequently the knowledge of their use has been lost with assimilation. 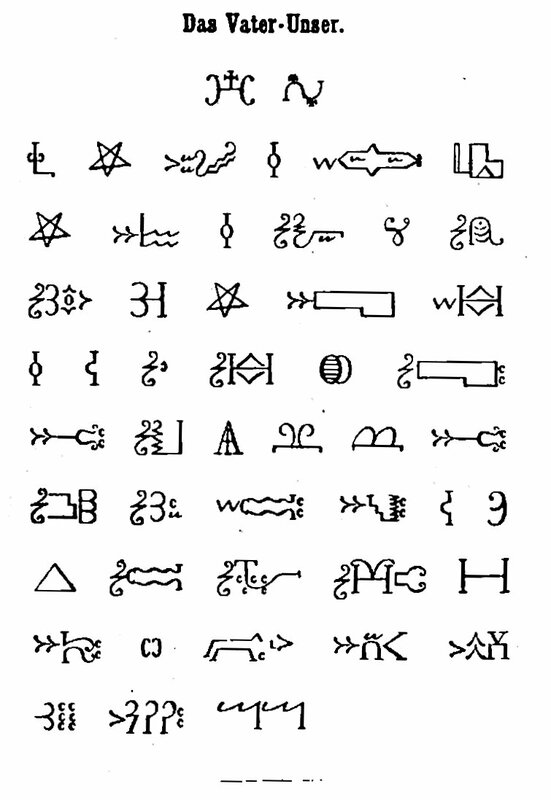 And finally, an apology to certain over-credulous individuals out there on the World Wide Web: Mi'kmaw ideograms were not learned from Egyptians, Mayans, Incas, or any other race (or vice versa), nor were they given to the Mi'kmaq by aliens. The Mi'kmaq did this all by themselves. Sorry to burst your bubble. 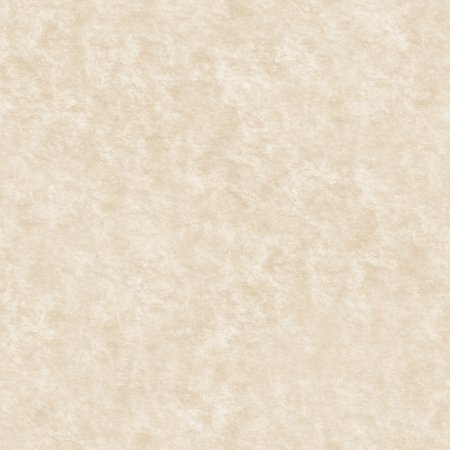 Late addition: I have recently come across a website by Richard Flavin, an independent scholar and researcher from Salem, MA. 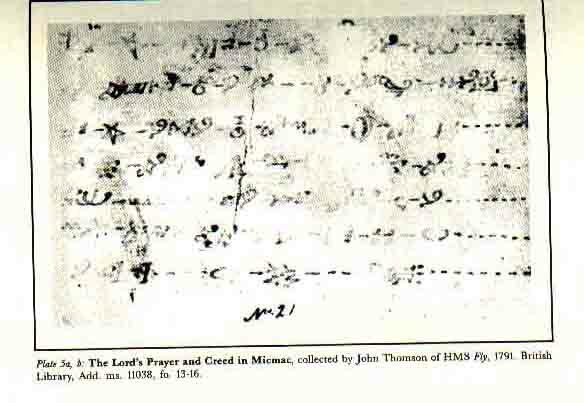 In an article entitled "Mi'kmaq Shorthand" he describes finding images of some form of writing on paper strips that had been used as bookmarks in a 19th-century Catholic prayer book that was written in Mi'kmaw ideograms. His research into these mysterious strips suggested that someone may have used a shorthand system to record something in the Mi'kmaw language. From there he discusses the development of several shorthand systems. 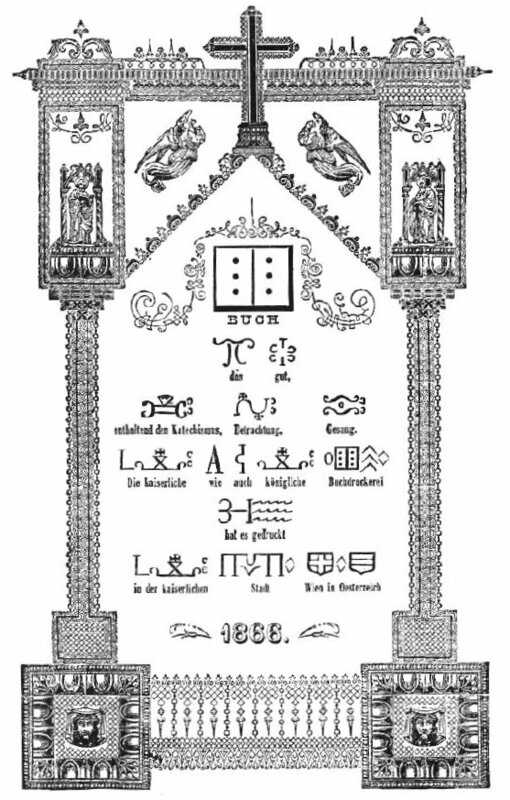 While reading this article, I noticed similarities between the Mi'kmaw ideograms found in Kauder's Bible and the symbols used in some of the shorthand systems, particularly those developed by John Byrom, Samuel Taylor, and Théodore-Pierre Bertin. The similarities in style are remarkable, and in my mind one of these systems (or another like them) may well be the source of many of the ideograms through which the missionaries added Christian and European concepts to the Mi'kmaw written language. It is a reasonable idea: Récollet and Jesuit missionaries of the time tended to be well-educated, and could easily have been aware of shorthand. If so, why not use such a system to create new ideograms for the Mi'kmaq, rather than invent symbols from scratch? The symbols would then have been easy for the missionaries to remember and interpret, and at the same time a huge creative effort would have been simplified. Difficult to prove, but a fascinating theory!